Mr. Hurd has previously built a full-size Chessie Flyer, Gypsy houseboat, and a model of the Coaster (See Customer Photos archives). I had so much fun building the model of the Coaster, I decided to build a model of the Chessie Flyer. 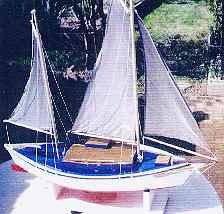 The Chessie Flyer was my first attempt at building a Glen-L boat. The boat turned out to be everything I had envisioned and more. This boat was a lot of fun. My wife, two girls and I took it all over northern California. Everywhere we went people would come over and inquire about it. As you can see by the picture in the lower right corner, I made the model so the roof comes off the cabin to expose the detail of the inner cabin. I made these two models while waiting for the weather to warm up so I can proceed with the full size Coaster I am building out doors along side of my home. As of this date, I have the hull framed in and need to do some minor fairing before attaching the paneling.